Bayer, A., J. Ruter, and M.W. van Iersel. 2014. Improved Growth and Quality of Gardenia jasminoides 'Radicans' and 'August Beauty'. HortScience. Accepted for publication. Bayer, A., Ruter, J. and van Iersel, M. 2014. Irrigation Volume and Fertilizer Rate Influence Growth and Leaching Fraction From Container-Grown Gardenia jasminoides ©. Acta Hort. (ISHS) 1055:417-422. Bayer, A., K. Whitaker, M. Chappell, J. Ruter, and M. van Iersel. 2013. Effect of irrigation duration and fertilizer rate on plant growth, subsrate EC, and leaching volume. Acta Hort. (ISHS) 1034:477-484. Bayer, A., I Mahbub, M. Chappell, J. Ruter, and M.W. van Iersel. 2013. Water use and growth of Hibiscus acetosella ‘Panama Red’ grown with a soil moisture sensor controlled irrigation system. HortScience 48:980-987. Bayer, A., J. Ruter, and M. van Iersel. 2013. Automated Irrigation Control for Improved Growth and Quality of Gardenia jasminoides ©. Acta Hort. (ISHS) 104:407-411. Bayer A., M. Chappell, J. Ruter, and M. van Iersel. 2011. Managing growth of Hibiscus acetosella by controlling substrate moisture with sensor controlled irrigation. SR-IPPS Research Conference Proceedings (http://ippssrna.org/pdf/2011Papers/21-Bayer-student.pdf). Bayer A., I. Mahbub, M. Chappell, J. Ruter, and M. van Iersel. 2011. Growth of ‘Panama Red’ hibiscus in response to substrate water content. SNA Research Conference Proceedings 56:134-138. Bayer, A. and J.R. Stewart. 2010. Prospects for conservation of an endemic woody species to Florida, Chionanthus pygmaeus (pygmy fringetree), through seed and vegetative propagation. Native Plant Journal 12(1)62-69. Bayer A., I. Mahbub, M. Chappell, J. Ruter, and M. van Iersel. 2011. Growth of ‘Panama Red’ hibiscus in response to substrate water content. 2011 Southern Nursery Association Research Conference in Mobile, AL. 19-20 January 2011. Bayer, A., J. Ruter, and M. van Iersel. Growth and water use of two Gardenia cultirvars in response to substrate water content-based irrigation. 2012 Annual Meeting of the Southern Region American Society of Horticultural Science. Bayer, A., K. Whitaker, M. Chappell, J. Ruter, and M. van Iersel. 2013. Effect of irrigation duration and fertilizer rate on plant growth, subsrate EC, and leaching volume. 2013 International Symposium on Growing Media and Soilless Cultivation (GroSci 2013) in Leiden, The Netherlands 17-21 June 2013. Bayer, A., J. Ruter, and M. van Iersel. 2013. Fertilizer rate and irrigation duration affect leachate volume, electrical conductivity, and plant growth. 2013 Conference of the American Society for Horticultural Science in Palm Desert, CA 22-25 June 2013. Bayer, A. and M. van Iersel. 2013. Using different teaching methods to enhance student learning of climate change. 2013 Conference of the American Society for Horticultural Science in Palm Desert, CA 22-25 June 2013. Bayer, A., J.Ruter, and M. van Iersel, 2014. Elongation of Hibiscus acetosella ‘Panama Red’ in well-watered and water-stressed conditions. 2014 Conference of the American Society for Horticultural Science in Orlando, FL 28-31 July 2014. After graduating from Penn State, Mandy worked as a landscape designer and in garden centers before going to graduate school. While at the University of Illinois she worked on propagation of Chionanthus pygmaeus, pygmy fringetree. Her Ph.D. research focused on improving irrigation and fertilization in container plant production, focusing on how plant growth is affected by substrate water content and fertilizer application rate. 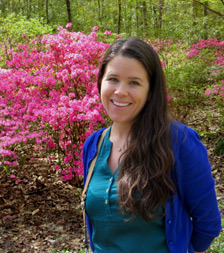 At the University of Massachusetts, Mandy will focus on sustainable landscape and nursery management to support the Massachusetts landscape and nursery industries. The overall goal of her research program will be to help the landscape and nursery industry adapt to climate change, changing resource availability, and/or consumer trends. Her research program will complement her extension program in serving the industry through applied research to help address industry concerns. Areas that she will focus on include more sustainable production of container plants and best management practices for the landscape and nursery industries; with an emphasis on improving irrigation and fertilization practices. She is also interested in using irrigation as a tool for controlling plant growth and how plant growth can be manipulated via irrigation control.